In anticipation of the World Premiere of “30,” director Constantinos Patsalides answered some questions via email for HollywoodChicago.com, regarding his new film. HollywoodChicago.com: The subject of your short film ‘30’ specifically is the Turkish invasion of Cyprus in 1974. It still affects Cyprus today, and the point of the short is that effect. What do you want to communicate about that situation, and how it resonates today? 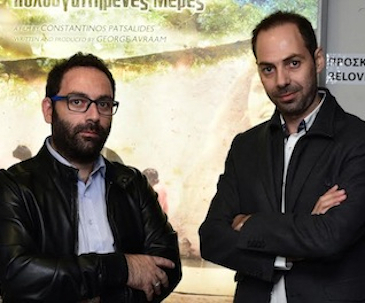 Constantinos Patsalides: Our short film “30” – it was written by George Avraam – is inspired by real events that happened during the Turkish invasion of Cyprus in 1974. As we researched the story, I was touched emotionally by the characters and I felt obliged to make this film. As difficult as the subject is, I wanted to make a film about my country. While reading back the script I saw the events evolving in front of me in pictures… it was a dramatic story that has left its footprint on my soul. Today, the people in Cyprus still live with the injustice and the remnants of invasion to a great extent… the island is still divided. 40,000 Turkish soldiers still occupy the north of the island, and thousands of people involved in the war have been missing since 1974, leaving their families with no closure. In many cases, families lost their home and their farm land, which was often their sole livelihood. Tens of thousands of people had to flee, many taking refuge overseas and many of them have never returned home. I believe that a problem this real cannot leave anyone indifferent. It’s a wound that never heals. HollywoodChicago.com: You focus on one family that cannot find a missing relative, who is a GreekCypriot soldier. How do those deaths back then still influence the politics of the island today? Patsalides: War has always been one of the biggest problems facing mankind, causing millions of dead or missing persons and countless casualties, who are often afflicted with injuries that people endure to the last day of their lives. The drama of the people who have lived through a war and an occupation anywhere in the world has tragic consequences. The Republic of Cyprus is undertaking efforts to obtain information about missing people and mass graves. But even today, Turkey denies access to their archives on this humanitarian issue and is intransigent on all levels regarding the negotiation of a lasting solution to the problem. And all the while they continue to ship colonists to the island, changing the demographics beyond recognition. HollywoodChicago.com: In 2015, you directed a documentary called ‘Beloved Days,’ about the filming of a Raquel Welch film on Cyprus in 1970, four years before the Turkish invasion. What emotionally affected you about the villager’s stories before war, in the sense that nothing was the same afterward? Patsalides: What influenced me most was the colorfulness of the time, the innocence of the ordinary people of a small village in Cyprus that suddenly opened its doors to Hollywood. More than forty years afterward these villagers lived through this great cultural event and were faced with the invasion of the Turks four years later, and they are still refugees in their homeland. I found it very interesting to tell the stories of those who experienced these two important events through their memories and feelings. On one hand, there was the cast and crew, with the glamour of Hollywood – Raquel Welch, Richard Johnson, Flora Robson, Frank Wolf, Patrick Curtis, the famous Italian DOP Marcello Gatti, and of course the unforgettable Greek director George Pan Cosmatos. On the flipside, we examined the pain of the villagers’ wounds from the 1974 invasion…. thus there were two different worlds and circumstances that marked their lives. HollywoodChicago.com: What has been your response so far to the film, and what do you hope to achieve with it during your upcoming festival run. Do you want to expand into a feature film? Patsalides: We got very positive feedback at Short Film Corner market in Cannes, which we attended in May of 2018 to promote our film, and we are very proud to be having our world premiere of “30” in competition at the 41st Greek Short Film Festival in Drama on September 20th, 2018 (more festival screenings are below). Definitely, we could expand ’30’ into a feature if we can obtain funding. There is a very powerful and solid story there and we would relish the big challenge to extend it. I would like to take this opportunity to express many thanks to the whole production team, cast and crew, as well as our colleagues in Greece, and the Authorwave Company for their excellent cooperation. Warm thanks also to The Cyprus Cinema Advisory Committee, and special thanks to our sponsors CYTA, ACS Courier, Volkswagen, EAC, Athens Cypria Hotel and all our supporters. The World Premiere of “30” will take place on September 20th, 2018, at the Greek International Short Film Festival. “30” has also been accepted in the 10th Cape Town International Film Festival (October 9th-19th, 2018), the 7th Tuzla Film Festival in Bosnia (October 16th-22nd, 2018), and has its National Premiere at the 8th International Short Film Festival of Cyprus (October 12th-19th, 2018). Written by George Avraam. Directed by Constantinos Patsalides. For more information on “30,” click here.